I've written parts of this story in the past, but never in one place and never in much detail. So why not now? In 1982 my family moved house, so one morning I went to school and at lunch-time I had to walk home to a completely different house. We moved sometime towards the end of the year, and ended up spending lots of money replacing the windows of the new place. For people in York I was born in Farrar Street, Y010 3BY, and we moved to a place on Thief Lane, YO1 3HS. Being named as it was I "ironically" stole at least two street-signs and hung them on my bedroom wall. I suspect my parents were disappointed. Anyway the net result of this relocation, and the extra repairs meant that my sisters and I had a joint Christmas present that year, a ZX Spectrum 48k. A 48k ZX Spectrum, with its glorious rubber keys. A pack of 10 (?) cassette-tapes. A version of Chess by Psion. I know we also received Horace and the Spiders, and I have vague memories of some other things being included, including a Space Invaders clone. No doubt my parents bought them separately. Highlights of my Spectrum-gaming memories include R-Type, Strider, and the various "Dizzy" games. Some of the latter I remember very fondly. Unfortunately this Christmas was pretty underwhelming. We unpacked the machine, we cabled it up to the family TV-set - we only had the one, after all - and then proceeded to be very disappointed when nothing we did resulted in a successful game! It turns out our cassette-deck was not good enough. Being back in the 80s the shops were closed over Christmas, and my memory is that it was around January before we received a working tape-player/recorder, such that we could load games. Happily the computer came with manuals. I read one, skipping words and terms I didn't understand. I then read the other, which was the spiral-bound orange book. It contained enough examples and decent wording that I learned to write code in BASIC. Not bad for an 11/12 year old. Later I discovered that my local library contained "computer books". These were colourful books that promised "The Mystery of Silver Mounter", or "Write your own ADVENTURE PROGRAMS". But were largely dry books that contained nothing but multi-page listings of BASIC programs to type in. Often with adjustments that had to be made for your own computer-flavour (BASIC varying between different systems). If you want to recapture the magic scroll to the foot of this Osbourne page and you can download them! Understanding your Spectrum, Basic & Machine Code Programming. 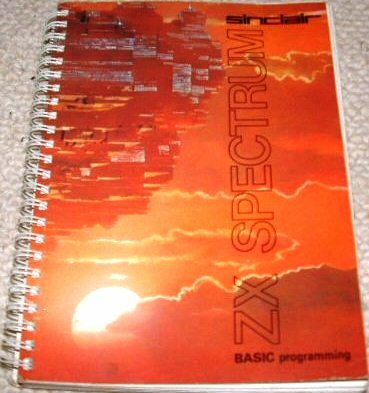 An introduction to Z80 Machine Code. Eventually I got some of my l33t POKES printed in magazines, and received free badges from the magazines of the day such as Your Sinclair & Sinclair User. For example I was "Hacker of the Month" in the Your Sinclair issue 67 , Page 32, apparently because I "asked so nicely in my letter". Anyway that takes me from 1980ish to 1984. The only computer I ever touched was a Spectrum. Friends had other things, and there were Sega consoles, but I have no memories of them. Suffice it to say that later when I first saw a PC (complete with Hercules graphics, hard drives, and similar sourcery, running GEM IIRC) I was pleased that Intel assembly was "similar" to Z80 assembly - and now I know the reason why. Some time in the future I might document how I got my first computer job. It is hillarious. As was my naivete. Tags: personal, spectrum. | 8 comments.